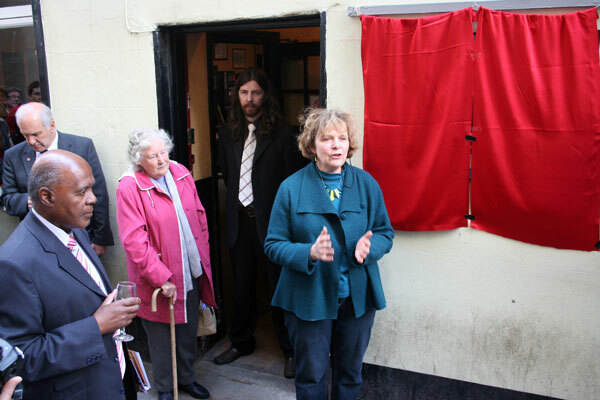 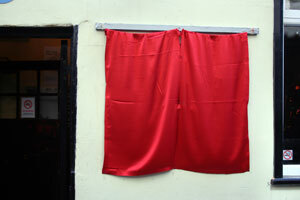 These photographs were taken by Andrew Swift at The Seven Stars Plaque unveiling on Friday 1st May 2009. The Seven Stars Plaque waiting to be unveiled. The Bristol Civic Society plaque on The Seven Stars. 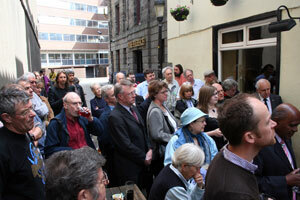 About 70 people turned out to see the new plaque unveiled. 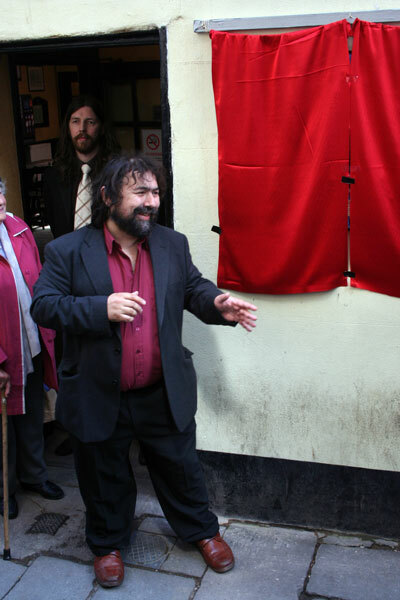 Madge Dresser and Paul Stephenson. 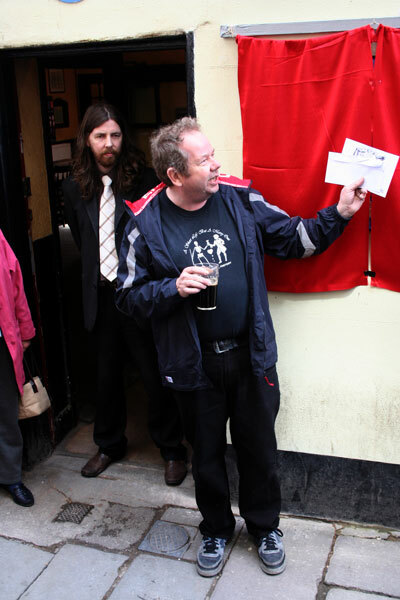 Mark Steeds of the Long John Silver Trust. 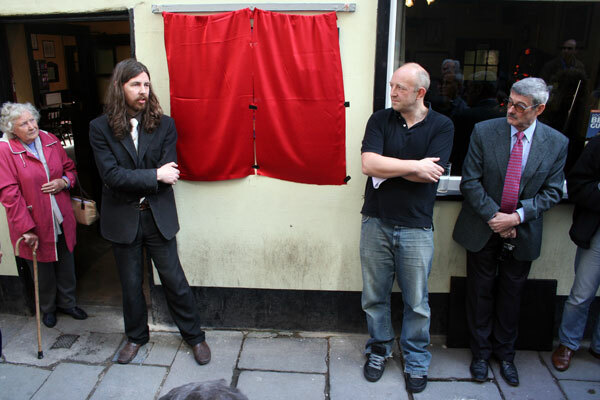 Steve Niven (left), landlord of The Seven Stars. 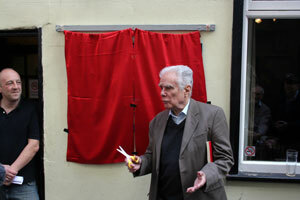 Richard Hart about to unveil the plaque. 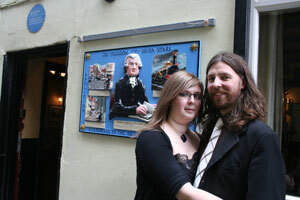 Steve and Katy, landlord and landlady of The Seven Stars. 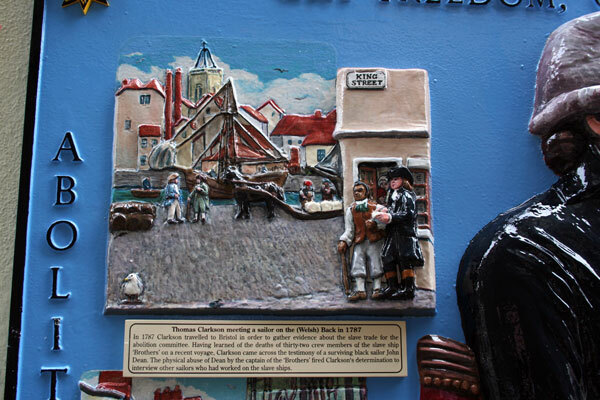 Top left panel, text reads: Thomas Clarkson meeting a sailor on the (Welsh) Back in 1787 In 1787 Clarkson travelled to Bristol in order to gather evidence about the slave trade for the abolition committee. 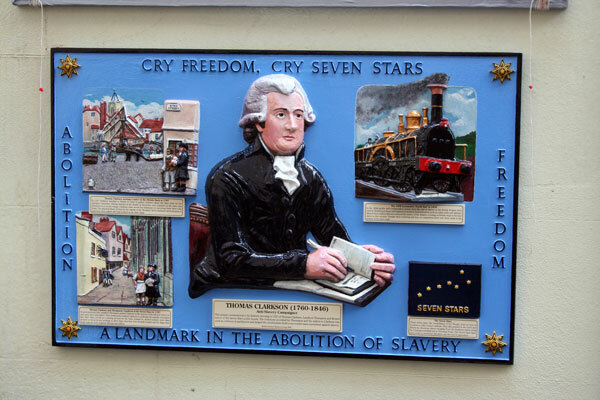 Having learned of the deaths of thirty-two crew members of the slave ship ‘Brothers’ on a recent voyage, Clarkson came across the testimony of a surviving black sailor John Dean. 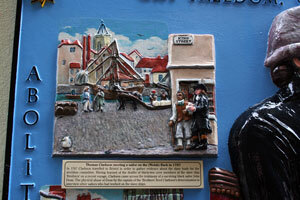 The physical abuse of Dean by the captain of the ‘Brothers’ fired Clarkson's determination to interview other sailors who had worked on the slave ships. 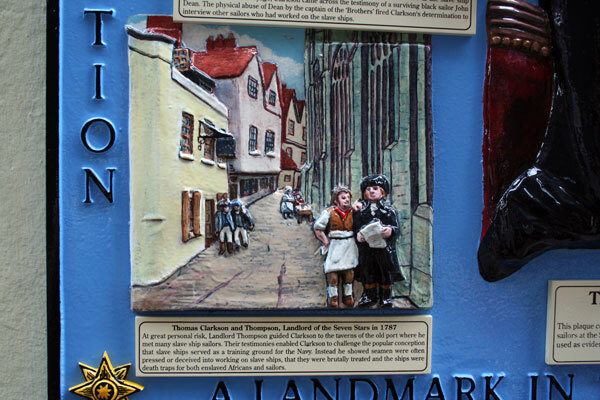 Bottom left panel, the text reads: Thomas Clarkson and Thompson, Landlord of the Seven Stars in 1787 At great personal risk, Landlord Thompson guided Clarkson to the taverns of the old port where he met many slave ship sailors. Their testimonies enabled Clarkson to challenge the popular conception that slave ships served as a training ground for the Navy. Instead he showed seamen were often pressed or deceived into working on slave ships, that they were brutally treated and the ships were death traps for both enslaved Africans and sailors. Top right panel, the text reads: The GWR Locomotive ‘North Star’ in 1838 In the 1830s profits and compensation money from the end of slavery in the British Empire were used by Bristol merchants and bankers to invest in local industries such as cotton mills and railways. Almost three million Africans endured the misery of the Atlantic crossing on British ships to become slaves in the colonies. 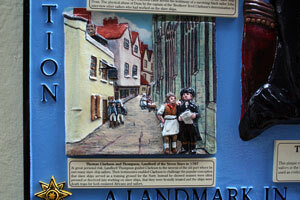 Despite their suffering and loss, no reparations have ever been made to the victims of the slave trade. 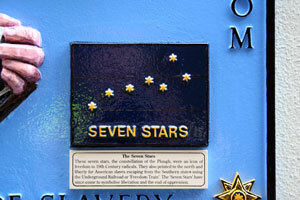 Bottom right panel, text reads: The Seven Stars These seven stars, the constellation of the Plough, were an icon of freedom to 19th Century radicals. 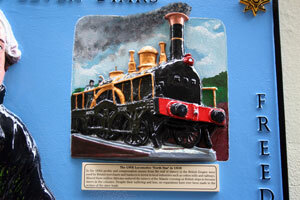 They also pointed to the north and liberty for American slaves escaping from the Southern states using the Underground Railroad or ‘Freedom Train’. 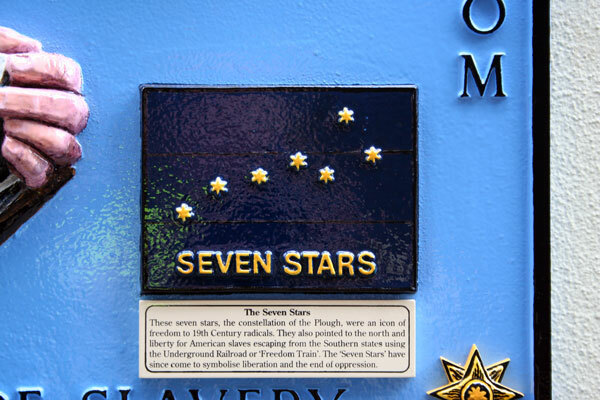 The ‘Seven Stars’ have since come to symbolise liberation and the end of oppression.